The 1st day – meeting at the airport, Saranpaul’ village, for two hours you make acquaintance with the village and goods’ purchase, then getting in off-road vehicle MTLB and going along the river Yatriya as far as the camp ( 35 km), overnight, the 2nd day – for the whole day fishing and hunting ( 70 km ), going by boat in the river Yatriya as far as lake Turupya to he main camp (mountain river with sandbars ). 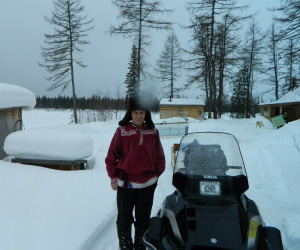 The 3d day – a rest, fishing, hunting in lake Turupya, Russian baths. The 4th day – travelling along the river Yatriya and the river Tuyakhlanya for a group, fishing, hunting, overnight there. The 5th day – fishing, hunting and going back to the camp in Turupya. The second group – going up the river Turupya with fishing, hunting ( overnight at the camp ). The 6th day – a rest at the camp, fishing, Russian baths. The 7th day – going down the river Yatriya as far as the first camp (fishing, hunting), by MTLB to Saranpaul’ village. The 8th day – departure. Hunting grounds are located in the mountain-hilly area of Polar Ural, bordering on the administrative border of Komi. Two times a week there is a helicopter flight from Priob'ye station. Four times a week from workers' settlement Berezovo (spring-summer-autumn period ) , winter road – from the end of December to April, motorway Yekaterinburg- Yugorsk- Agirish-Khulimsunt-gasway-Saranpul’ village ( passenger vehicle). There is a waterway- the river Lyapin- Igrim village-N.Naryikaryi- Priob'ye station. Authorization for a trophy, accommodation, service (light, firewood logging, meal preparation), food (flour, salt, sugar, potatoes, macaroni and cereals, tea, vegetable oil), the rest food is at your own cost. 50% of a tour price is made as a deposit for 5 days after deciding the date of hunting. A final balance is paid 20 days before the hunt start. If a participant was given the right to shoot and he/she shot but failed to hit, 100% of payment is made for service. A deposit isn't refundable, but it can be changed for another date by agreement with the hunting ground.